The blue box hides a pre-production sample, though it is of high quality and has a rich set of accessories. 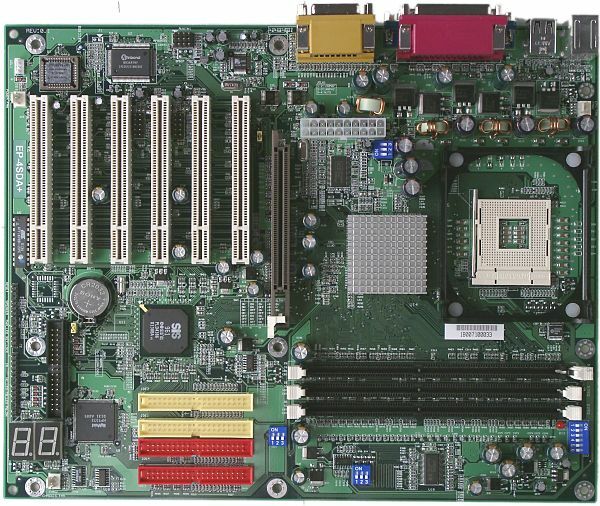 The layout has some disadvantages: IDE and FDD connectors are placed behind PCI slots (because of the IDE RAID controller), and audio-ins are located in front of the 2nd and 3d PCI slots. There are also two LEDs which monitor the POST procedure. The feed circuits incorporate 6 capacitors of 3300 uF and 4 of 2200 uF. 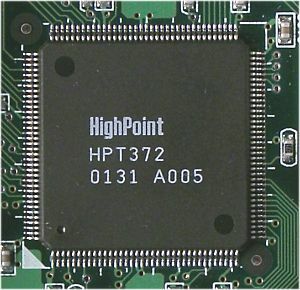 There are the following controllers: AC'97 codec ALC201A from Avance Logic (audio solution) - the chip supports SPDIF, but the respective connector is lacking; IDE RAID controller supporting ATA 133 protocol on the HPT372 from HighPoint. 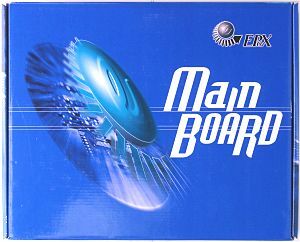 There are no any non-unsoldered elements on the board. Brief characteristics of the board: memory slots - 3 DDR SDRAM; expansion slots - AGP/ 6 PCI; I/O ports - 2 COM/ LPT/ 2 PS/2/ 6 USB; dimensions - 305x245 mm. This board from the overclocker-friendly manufacturer isn't very speedy this time. However, it is much faster than many other today's competitors. Besides, it was just a pre-production sample.